Who: Women & Children of all ages. 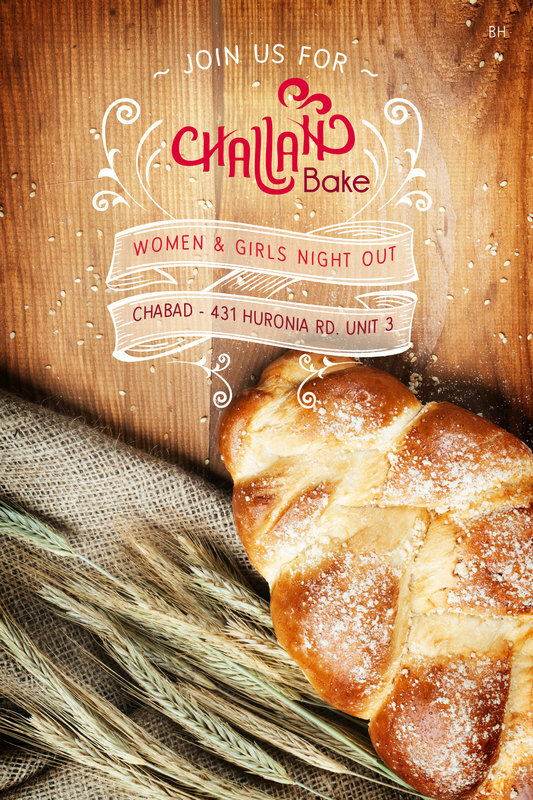 Where: Chabad, 431 Huronia Rd, unit 3. Co-sponsorship: $180 or any other amount you would like to contribute. RSVP: Please complete the form below to help us plan accordingly. Challah – the separation of a small part of kneaded dough before it is baked into bread and donating it to the kohanim (priests). Eating may be seen as a very self centered task, and rightfully so: we work hard for our food, and we must eat to live. But the Torah tells us "man does not live by bread alone, but rather by whatever comes forth from the mouth of the Lord does man live". By setting aside Challah, the woman demonstrates her appreciation to G-d for giving her food, and her willingness to use it for the purpose He provides it. Only after she acknowledges G-d and shares with her fellow, does she tend to her own needs.